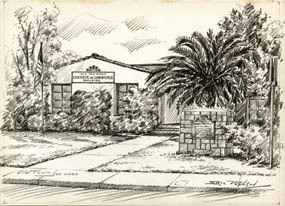 Various drawings are from a large collection of drawings in our inventory by Eric Poulson depicting landscape and city scenes in San Diego, California, and the surrounding area. The particular ones shown here are of San Diego’s Old Town, which, as the name implies, is the oldest section of San Diego. 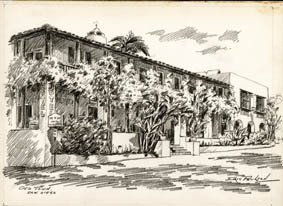 The drawings include a building named for Ramona, a romantic novel by Helen Hunt Jackson (1830-1885). 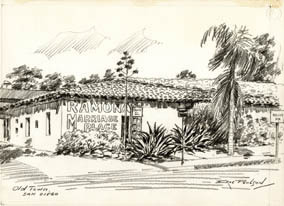 Jackson’s work was fictional, but enterprising San Diegans capitalized on the popularity of the tale by selling postcards of buildings purporting to be “Ramona’s Marriage Place” into the mid 20th century.